Cambridge Satchel is a British brand manufacturing leather satchels and bags with the modern design and array of colours. The original collection of products from Cambridge Satchel was based on original Oxford and Cambridge design for school children, but gradually gained high demand in the world of fashion and accessories. You can avail everything from satchels, backpacks, tote bags, clutch bags for women; shoulder bags, card holders, map bags for men as well as browse from their exclusive collection, including The Saddle Collection, The Peanut Collection, The Vivienne Collection and many more. 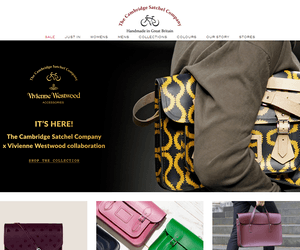 Check out this video and have a look at the exclusive Vivienne Westwood Collection from Cambridge Satchel. Avail Great Quality Bags At Discounted Rates! Browse the site, select the bag you wish to buy and put it in the shopping basket. Proceed to checkout. Here you will find a box for entering the discount code. Enter the latest promo code you have and click ‘APPLY CODE’. The discount will be subtracted from your total purchase order automatically. On the next page, you will have to login or sign up on the website to make the payment. Submit all your contact details, shipping and billing address, select the payment method and submit the payment. You will get your bag delivered at your doorstep for a very reasonable price. Cambridge Satchel is your perfect destination for a variety of handmade satchels and other leather goods from a natural material. The company was founded in 2008 and today has become a reputed name in the fashion world stocking products in over 120 countries worldwide. Their satchels are made from quality material and available in a myriad of colours to suit everyone’s choice and preference. Grab our free Cambridge Satchel voucher code and avail good savings on your leather bag purchases.